PRAGUE, 9th June, 2015 – Palmer Capital, a fast-growing property fund and asset manager with €1 billion of assets under management in Central and Eastern Europe, announced today that they are proud to have served again as the main sponsor of the 3rd annual charity Softball Tournament organised by the RICS together with Palmer Capital. The tournament took place on 4th June at the JOUDRS softball club in Prague 8 – Bohnice. William Bucknell, Chairman of the Board of RICS in the Czech Republic, said: “I would like to sincerely thank Palmer Capital for sponsoring of the event again this year. 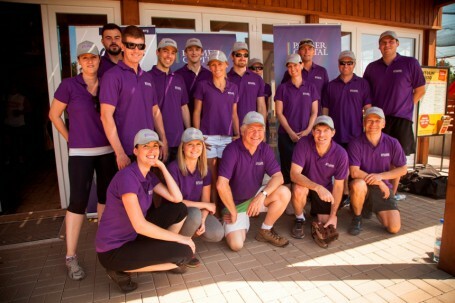 Records have been broken this year with a total of ten teams competing in the 2015 tournament.” RICS (Royal Institution of Chartered Surveyors) is a global professional body which promotes and enforces the highest professional qualification and standards in the development and management of land, real estate, construction and infrastructure. The participating teams were Palmer Capital, Capexus together with DTZ, CBRE, Colliers International, Cushman & Wakefield, The International School of Prague, JLL, Knight Frank, RICS, and Svoboda & Williams. The competition was enjoyed by all teams. The winning team was The International School of Prague, followed by Knight Frank in second place and Colliers International in third. Mrs. Renáta Perlíková, Deputy Director of Domov Sedlec SPMP o.p.s. stated that the money will go toward maintenance and modernization of buildings and property for Denní stacionář (Day Care) and Chráněné bydlení (Protected Living). Denní stacionář is a social education program for adults with mental/combined disorders that facilitate their ability to live a normal life via personal treatment, assistance with day-to-day duties, such as shopping, food preparation, housecleaning, transport, social contacts, as well as educational services, such as teaching participants how to write. Chráněné bydlení helps people with mental/combined disorders and provides accommodation with special assistance, giving its residents the opportunity for personal development.